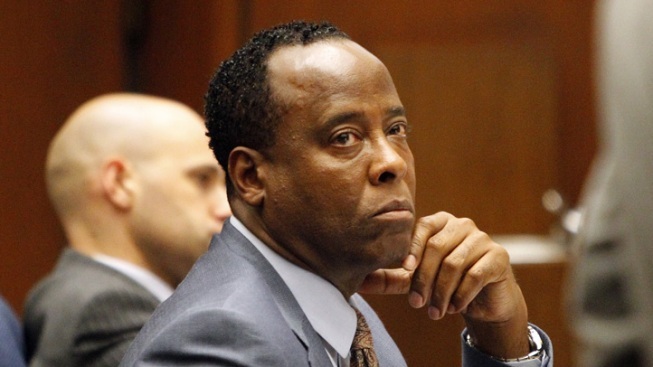 Dr. Conrad Murray appears in court. The first paramedic to enter Michael Jackson's bedroom testified Friday that the singer's personal physician never mentioned the powerful sedative propofol and that Dr. Conrad Murray initially said Jackson was not suffering from a specific condition. Senneff described the scene when he first entered Jackson's bedroom -- a "frantic" Dr. Murray, Jackson -- in pajamas and a surgical cap -- and Jackson's security guard. With an IV bag and other medical equipment in the room, paramedic Richard Senneff said Murray's statements did not make sense. Senneff and paramedic/ambulance driver Martin Blount, who also testified Friday, said they believed Jackson was already dead by the time they arrived at the Carolwood Drive residence. Dr. Richelle Cooper, one of two emergency room physicians who were present at UCLA Medical Center when Michael Jackson arrived, testified that the pop star was long dead by the time he arrived at the ER. Cooper had advised the paramedics to pronounce Jackson dead at the house, but Murray insisted his patient be transported to a medical center. That was about 30 minutes after the medical team began attempts to revive Jackson. The most riveting testimony on Day 4 of Murray's involuntary manslaughter trial came from Seneff, who described his impressions of the scene when he arrived in Jackson's bedroom. "The patient appeared to be underweight to me," Senneff testified Friday at Murray's involuntary manslaughter trial. "(Murray) was leaned over the patient and holding the patient's torso. He was moving the patient from the bed to the floor." Senneff said he repeatedly asked Murray, "What's his underlying health condition?" Eventually, Murray told the paramedics Jackson was being treated for exhaustion and dehydration, Senneff said. Murray never told paramedics that Jackson had received the powerful anesthetic propofol, Senneff said. The only drug Murray mentioned was the sedative lorazepam, he added. Paramedic Blount testified Friday that paramedics were already assisting Murray get Jackson off the bed when he arrived. "(Murray) was a little flustered, sweating profusely," said Blount. "He was a little agitated. He said, 'Could you help me, please.'" Another witness called by prosectors Friday was an executive from a medical equipment company in an attempt to show that Murray did not have adequate medical equipment to monitor Jackson on the day he died. Robert William Johnson, an employee of a non-invasive medical equipment company. The company makes a device that measures pulse and oxygen levels in the blood. The $275 device was found after Jackson's death. Johnson told jurors Friday that the model had no audible alarm and is not intended to be used for continuous monitoring of patients. "It's specifically labeled against use for continuous monitoring," Johnson said. Propofol, the drug that Murray administered to Jackson, is usually administered only in hospital settings. The testimony came after a day of powerful testimony from a bodyguard who ran into the bedroom and saw Jackson unresponsive on a bed as his children watched. Earlier Friday, one of the doctor's former patients testified about the day he learned Murray would no longer be treating him. Prosecutors introduced the letter the patient received from Murray that announced the doctor's decision to make Jackson his only patient. Robert Russell, who was under Murray's care after a heart attack, told the jury he felt "abandoned." "I felt like I was getting the best care in the world,'' said Russell, a Las Vegas resident. During the third day of testimony Thursday, Jackson guard Alberto Alvarez -- one of the prosecution's most important witnesses -- testified that he escorted Jackson's older children from the room after the superstar's personal physician yelled, "Don't let them see their dad like this." He returned to the room and Murray handed him several drug vials, which the doctor told him to place in a bag, Alvarez testified. Alvarez was the first guard to enter the bedroom on June 25, 2009. In court Thursday, he identified a propofol bottle inside an IV bag as the same items he saw in Jackson's bedroom on the day he died. Prosecutors also played audio of the guard's 911 call. The dispatcher can be heard telling Alvarez to move Jackson to the floor. Alvarez said Murray had been administering chest compressions while Jackson was on the bed. Under cross-examination of Alvarez Thursday, the defense used phone records in an attempt to prove that Alvarez could not have performed all the actions he claimed. He was questioned several times about whether he was confused about the timeline. "Do you think you could have performed all these events in half a minute?" defense attorney Ed Chernoff said, using phone records to indicate how much time the defense claims passed during Alvarez's encounter with Murray and the time he made the 911 call. Defense attorneys also questioned whether Alvarez did not call 911 right away because he was distracted by the sight of Jackson's children. During opening statements Tuesday in the long-awaited trial, prosecutors made it clear they plan to show that Murray administered propofol, a powerful anesthetic, to Jackson, then failed to properly monitor his patient. Defense attorneys countered by saying it was Jackson who self-administered the fatal dose of propofol. That, combined with lorazepam, created a "perfect storm" inside the King of Pop's body that led to his death, the defense claims. Jackson's parents and siblings have watched the emotional testimony, which included several accounts of a frantic scene in Jackson's bedroom. "On my way to court another day closer to a verdict. All I ask for is justice! 4 years isn't enough for a life!" Jackson sister LaToya Jackson tweeted Friday morning.